Astronautsliving aboard the International Space Station were surprised by the unexpectedlystrong vibrations that rattled their orbiting lab last month, but don?t believethe event damaged their $100 billion outpost. Spacestation commander Michael Fincke of NASA said the Jan. 14 vibrations shookobjects loose from the walls during a scheduled engine burn, but it did notimmediately spark concerns over the health of the spacecraft. ?We weredefinitely surprised,? Fincke told SPACE.com Thursday via a video link. ?It?s not usual during a reboost to see anything come off the walls.? Videofrom a camera inside the space station showed equipment doors and otherobjects shaking back and forth. The vibrationson Jan. 14 occurred during what was expected to be a routine Russianthruster firing to boost the space station into a higher orbit. During the two-minute,22-second maneuver, sensors aboard the space station picked up vibrations thatexceeded acceptable limits. MichaelSuffredini, NASA?s space station program manager, saidTuesday that a subsequent analysis has shown that the vibrations did notshorten the orbiting lab?s 15-year design lifetime. Space station flightcontrollers, however, did cancel another planned thruster firing slated forWednesday pending more study. ?Fortunately,the results of the analysis so far shows that we haven?t hurt the spacestation,? Fincke said. ?But we certainly could have, so we?re definitely goingto be very careful next time.? Finckedescribed the engine burn as the strongest thrust he and his two crewmates hadfelt since they launched into space last fall aboard a Russian Soyuz rocket andNASA space shuttle. Whenever Fincke let go of a handhold in the station, therest of the ship would noticeably move around him as he floated inweightlessness. ?At thetime it was quite amazing,? Fincke said. ?Then the harmonic vibrations startedto kick in and we saw things shaking off the walls. That was surprising, but itdidn?t last very long.? Theastronauts then had to fly through the space station?s cabin collecting looseitems and reattaching them to the outpost?s walls, he added. 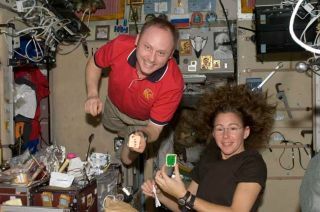 With thevibration event behind them, the space station crew is preparing the orbitinglab for the arrival of a new Russian cargo ship and the space shuttle Discoverylater this month. The unmanned cargo ship Progress 32 is slated to launch earlynext week and dock at the station on Feb. 13. But the planned Feb. 12 launch ofDiscovery has been delayedat least one week as engineers evaluate a fuel flow control valve concern. For spacestation flight engineer Sandra Magnus, also of NASA, Discovery?s delay means alonger stay in orbit. Magnus arrived at the orbiting lab last November and willreturn home aboard Discovery. ?Of course,with shuttle schedules you never really want to get your heart set on aspecific date because it?s a very flexible program," Magnus told SPACE.com. ?Another week is fine,they?ll make the right decision when to launch the shuttle and I?ll go homewhenever it arrives.? Discoveryis now slated to launch no earlier than Feb. 19 to deliver the last set of U.S.solar arrays and Magnus?s replacement, Japanese astronaut Koichi Wakata. Earlierthis week, Magnus raided the space station?s pantry to put together somespecial treats during Sunday?s Super Bowl showdown between the PittsburghSteelers and Arizona Cardinals. Fincke, a Pittsburgh, Pa.-native who grew up inEmsworth, is a vocal Steelers fan who beamed down video messages of support tospur his team on during the NFL playoffs and their Super Bowl win. ?We reallydidn?t have a party, but Sandy did. She put together some really amazing dipsand other Super Bowl treats that we normally would have on the ground,? Finckesaid. ?It made the day even more special. ?